You (and your team) can win up to 75.000 DKK (10.000 Euro) production grant to get the project going. There's also a potential publishing deal in there, if Gyldendal and their jury finds projects that look promising enough. 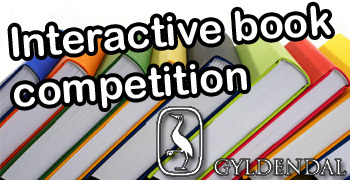 Gyldendals goal is ".. to develop new original interactive e-books and apps to children at the same high level of quality as our paper-back books" and they need your help! The target age group is kids 0-8, and deadline for applications is 15th of august 2012.